Definition at line 1123 of file CCopasiXMLParser.h. Definition at line 1131 of file CCopasiXMLParser.h. Definition at line 3725 of file CCopasiXMLParser.cpp. Definition at line 3735 of file CCopasiXMLParser.cpp. 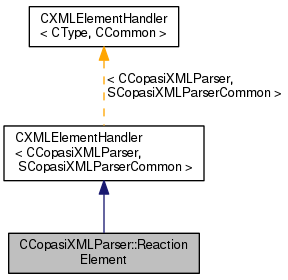 Definition at line 3918 of file CCopasiXMLParser.cpp. References SCopasiXMLParserCommon::CharacterData, CCopasiMessage::EXCEPTION, CReaction::getKey(), CAnnotation::getUnsupportedAnnotations(), CCopasiXMLParser::mCommon, MCXML, CExpatTemplate< CExpat >::mParser, SCopasiXMLParserCommon::pReaction, CAnnotation::setMiriamAnnotation(), CAnnotation::setNotes(), START_ELEMENT, and UNKNOWN_ELEMENT. Definition at line 3744 of file CCopasiXMLParser.cpp. References CCopasiVectorN< CType >::add(), CCopasiMessage::EXCEPTION, fatalError, CKeyFactory::get(), CModel::getReactions(), SCopasiXMLParserCommon::KeyMap, CCopasiXMLParser::mCommon, MCXML, CExpatTemplate< CExpat >::mParser, SCopasiXMLParserCommon::pModel, SCopasiXMLParserCommon::pReaction, CReaction::setFast(), CCopasiObject::setObjectName(), CReaction::setReversible(), CReaction::setSBMLId(), and UNKNOWN_ELEMENT. 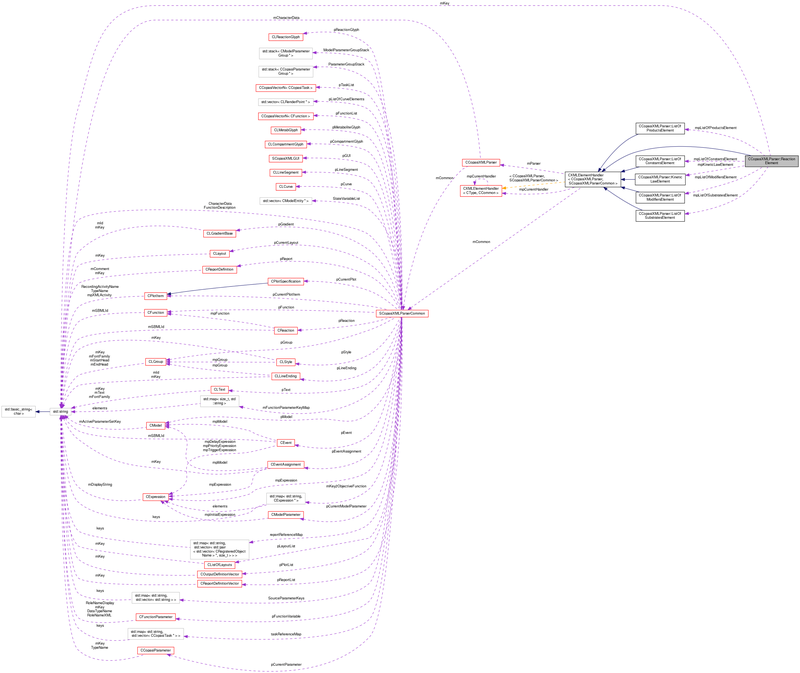 3794 if (strcmp(Compartment, "Compartment_00")) //TODO necessary? Definition at line 1172 of file CCopasiXMLParser.h. Pointer to ListOfConstantsElement element handler. Definition at line 1167 of file CCopasiXMLParser.h. Definition at line 1162 of file CCopasiXMLParser.h. Pointer to ListOfModifiersElement element handler. Definition at line 1157 of file CCopasiXMLParser.h. Pointer to ListOfProductsElement element handler. Definition at line 1152 of file CCopasiXMLParser.h. Pointer to ListOfSubstratesElement element handler. Definition at line 1147 of file CCopasiXMLParser.h.